The Ravens won week 2 vs Cleveland at M&T Bank, 14-6. Some notable changes have occurred since week 2 for the Browns, including Jason Campbell starting this week and Trent Richardson being traded to Indy. The Ravens defense has been improving each week, especially the front 7 which has been able to pressure QBs. 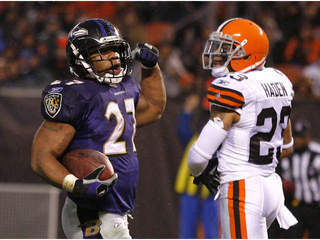 While it would be easy to chalk this down as a win for the Ravens, don’t forget this game is being played in Cleveland. The Dawg Pound is always rocking, regardless of the teams success, so I expect this game to be a close one. Ravens should shut down the Browns rushing game, but I’d expect Jason Campbell to have a few scrambles out of the pocket. Limiting Josh Gordon and Jordan Cameron will be essential. Their explosive play ability is in the tops in the league. The Browns defense is one of the best in the league. 6th in passing and 11th in rushing. They have also played Green Bay, Detroit, Kansas City, Cincinnati and Minnesota(only rushing attack), all teams with top offenses. The Ravens will not be able to run the ball, so this game should depend of Flacco and the defense. The Browns secondary is pretty good, including All Pro Joe Haden, so Flacco needs to stay calm in the pocket and make smart, quick decisions. They also have one of the better front 7 including Kruger, D’qwell Jackson, Phil Taylor, and rookie standout from LSU Barkevious Mingo, who has 4 sacks. This is a tough call because I think it’s really a toss up, but I’m going to guess a 20-13 Raven’s victory. Suggs, Dumervile, and Ngata apply pressure and close running lanes all game, Flacco does enough in a defensive battle to get the W in Cleveland. This entry was tagged Baltimore Ravens, Barkevious Mingo, Browns, Cleveland Browns, D'qwell Jackson, Elvis Dumervile, Haloti Ngata, Jason Campbell, Joe Flacco, Joe Haden, Jordan Cameron, Josh Gordon, Paul Kruger, Phil Taylor, Ravens, Ravens at Browns, Ravens vs. Browns, Terrell Suggs, Trent Richardson, Week 9 NFL. Bookmark the permalink.